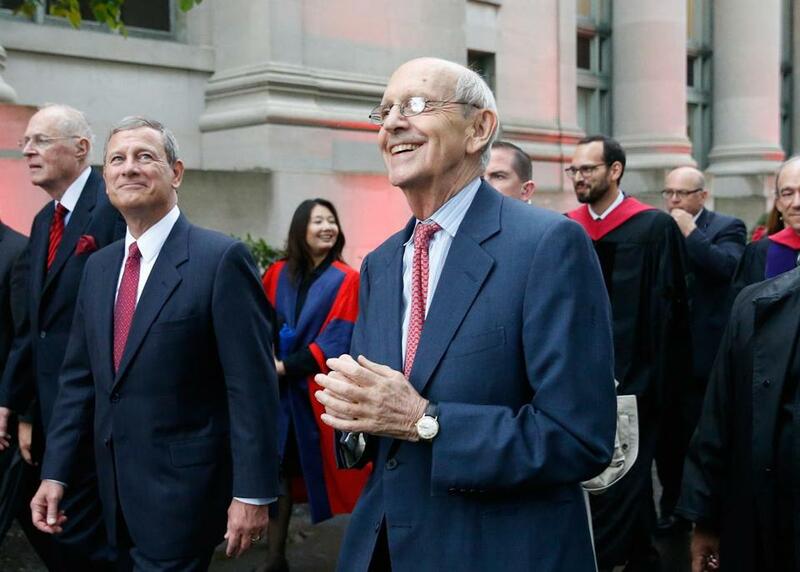 (Left to right) Supreme Court Justices Anthony Kennedy, John Roberts, and Stephen Breyer took part in a procession to mark Harvard Law School&apos;s bicentennial on Thursday. CAMBRIDGE -- Justice Anthony M. Kennedy recalled being caught by the dean of Harvard Law School at a Red Sox game in 1960, the day before a major tax-law exam. Chief Justice John G. Roberts Jr. fondly recalled making a pilgrimage almost every day to Baskin-Robbins in Harvard Square. And retired Justice David H. Souter somewhat sheepishly acknowledged landing in the university health services offices after taking part in a mock sword duel during his second year of law school. “It was a way to pass the time,” Souter said by way of explanation. They were the kind of stories you might hear at any law school reunion, only the graduates who returned to Harvard on Thursday to reminisce about their student days all happened to be justices of the Supreme Court of the United States. Five current and one former justice took part in the unusual public discussion at Sanders Theatre to mark the law school’s bicentennial. Court observers said such a conversation among six justices was unprecedented in recent memory. The discussion showcased the justices in a less formal and often jovial setting, as they laughed frequently and talked about their favorite professors and the challenges of serving on the nation’s highest court. The event didn’t touch on any cases currently before the court, President Trump, or other controversial topics. Mostly, it was an opportunity for the justices to talk about the law, show a more personal side of themselves, and tout their alma mater. The justices marched together from the law school library to Sanders Theatre, surrounded by law school students snapping pictures on their phones. Harvard Law School, founded in 1817, claims 20 graduates who have served on the high court — more than any other law school — plus three who attended but did not graduate: Ruth Bader Ginsburg, Melville Fuller, and William Henry Moody. In a nostalgic mood, Kennedy recalled that when he was caught at the Red Sox game by the dean of the law school, Erwin Griswold, he had lugged the revenue code with him so he could study at Fenway Park. The law school dean, John F. Manning, asked the justices what careers they would have pursued if they weren’t judges. “And better yet, one who does one in the summer, and one in the winter,” he said. Roberts said he would be “hounding President Faust” for a job as a professor of modern European history. Kennedy said he would teach English literature or political thought. The justices also talked about formative jobs they had before joining the high court. Kennedy remembered using a hammer to help build oil rigs in Canada and Louisiana and once becoming so nervous when the foreman came around, that he nailed his glove to the rig. Roberts recalled, as he often does, that when young he was a member of the United Steelworkers union. Senior electricians, he said, liked to tell him to tighten bolts “that happened to be live” with electricity. “It just never got old for them,” he said.